"We thought, why don't we try to really translate the cardboard look and feel to porcelain," says Carole Baijings, standing in front of several dozen models, prototypes, and finalized products of teacups rendered in varying textures. "It was quite challenging to figure out, but we found that if we mixed very tiny metal chips into the porcelain it would get this effect." In the end, what she fondly calls a "wild idea" took nearly five years—and countless experiments—to realize. The finished versions—a series of matte, paperlike cups and saucers—are now produced by Japanese porcelain brand Arita. These pieces and more stand on display in “Scholten & Baijings: Lessons from the Studio,” an interactive installation unveiled yesterday in New York's Cooper Hewitt Museum's first-floor Process Lab, and on view through March 2019. Reference board and models for Colour One, Scholten & Baijings' collaboration with MINI. 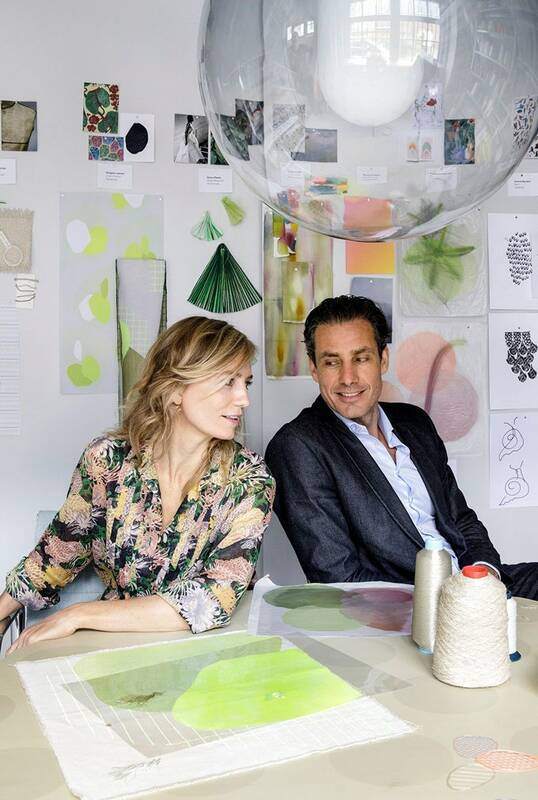 "It's really about our way of working," explains Baijings, who runs the 18-year-old Dutch design firm with her husband, Stefan Scholten. "The Cooper Hewitt has some of our prototypes and final products, and we thought it was interesting to show how our design process goes, beginning to end—how we mix our own colors and create our own materials and make our own models." On an afternoon ahead of the show opening, Baijings walks me through the process by which she and Scholten have arrived at their first sofa (for Herman Miller), a series of tableware (for Arita), and textiles (for Maharam). For their latest collaboration with Maharam, in fact, they found inspiration right here at the Cooper Hewitt. An installation view shows the process behind Scholten & Baijings' collaboration with Arita porcelain. "We called them Darning Samplers, and they're actually based on these traditional Dutch textiles," she explains, pointing out a delicate study in color and stitchery from the Cooper Hewitt's archive. "Most of them date back to the 1700, as a teaching tool for young girls to learn how to darn and sew." After intensive study of archival textiles, the duo realizes a series of fabrics with geometric motifs inspired by the stitches and color compositions in those they observed. Visitors to the exhibition are invited to explore a similar process, creating their own color palettes and compositions with scraps of tissue paper available at tables across the lab. "It's always nice to give the public a little more insight into what the design process is," Baijings explains. "The end result doesn't always raise questions—either you like the cup or you don't—but it's nice for people to realize, OK, it takes five years to get this cup. You appreciate the object more when you understand how it's made."